The sanctions renewal notice posted on the White House website on March 4. 2019. US President Donald Trump has extended by another year, his government's sanctions targeted at former President Robert Mugabe, top local politicians and firms accused of undermining Zimbabwe's democratic processes. This is contained in an executive order signed by Trump and posted on the White House website on Monday. "The actions and policies of these persons continue to pose an unusual and extraordinary threat to the foreign policy of the United States. 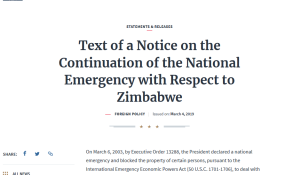 "For this reason, the national emergency declared on March 6, 2003, and the measures adopted on that date, on November 22, 2005, and on July 25, 2008, to deal with that emergency, must continue in effect beyond March 6, 2019. "Therefore, in accordance with section 202(d) of the National Emergencies Act (50 U.S.C. 1622(d)), I am continuing for 1 year the national emergency declared in Executive Order 13288." The sanctions were imposed 2003 "to deal with the unusual and extraordinary threat to the foreign policy of the United States constituted by the actions and policies of certain members of the Government of Zimbabwe and other persons to undermine Zimbabwe's democratic processes or institutions." According to the White House, "These actions and policies had contributed to the deliberate breakdown in the rule of law in Zimbabwe, to politically motivated violence and intimidation in that country, and to political and economic instability in the southern African region." The renewal of sanctions against the Zimbabwean government now led by President Emmerson Mnangagwa is a slap in the face for SADC whose leaders have intensified their demands for the scrapping of the measures by the superpower. The Zimbabwean government continues to single out sanctions as the main barrier to its bid to turn around the fortunes of the national economy. Zimbabwe's opposition and civil society organisations insist that the current Mnangagwa led government has not done anything to see the country break from its bitter past under his predecessor. A recent crackdown on anti-government protesters has seen 17 civilian deaths through gunshot wounds by security forces while the state has renewed its persecution on government critics. MDC leader Nelson Chamisa has described Mnangagwa as a worse dictator than his predecessor.